The new Silver Ray wedges are premium cast from solid feeling, stainless steel. The beveled heel and toe of the sole offer complete versatility for their usage. 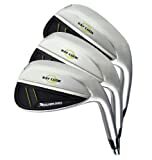 While the heads were designed with a traditional look in mind and given a non-glare satin finish for cosmetic appeal, the slightly oversized head shape gives players exactly what they need for their short game play.